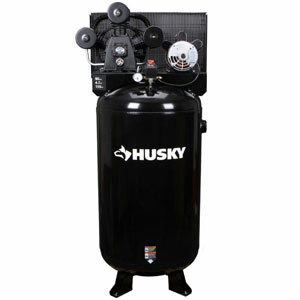 Husky 80 gallon air compressor is one of the most powerful air compressors which are manufactured by Husky. This compressor is equipped with a powerful three-cylinder cast-iron pump with cast iron one-piece 4.7 HP engine. Air tank is also made of cast iron. Flexible plate valves are made from strong Swedish steel. It also equipped with a cast-iron 12-inch balanced flywheel, sight glass to determine the level of oil in the system, pressure gauge to determine the air pressure and a large incoming air cleaning filter. Husky 80 gallon air compressor provides 16.1CFM at 40psi, 14CFM at 90psi and maximum pressure 155psi. Thanks to this you will always have the optimum performance for your air tools. Due to the fact that the air compressor is equipped with a large 80-gallon air tank you have the opportunity for a long time to work with such air tools as: grinders, impacts, spray guns, sanders etc.